1 Sweets So Geek, which offers cakes, chocolates and ice cream in off-the-wall themes and flavors, has been open for more than five years. What made you think a place like yours could succeed in as determinedly normal a place as Fort Wayne? Fort Wayne has never struck me as a “normal” place. We've had so many fun restaurants, unique festivals and a willingness to try things that, to me, there wasn't fear in us being different. The joy that we see in our customers from the unique offerings shows that there's absolutely a desire for off the wall. And we mix those items and offerings with traditional items like crème brûlée and a classic vanilla bean ice cream on our menus so that there is always something for everyone. 2 One of your current offerings involves maple ice cream with bacon brittle and chocolate sauce. Is that the most unlikely flavor combination you've offered? Maple Bacon Chocolate is up there for uniqueness, but we've had some really “out there” flavors and ideas. We've had basil ice cream, vegan avocado strawberry ice cream, chocolate maple bacon cake, cotton candy inside of chocolates, we bake pies inside of cakes for our Pi Day event every year, and so many other things that have worked or, sometimes, failed. I'm not afraid to try things together and see what happens. In fact, we're working with 2 Toms Brewing and pairing desserts with beers for Valentine's and have some really fun flavors happening with those. 3 How does Valentine's Day hold up in a health-obsessed world? Wouldn't it be more socially acceptable to offer the special people in our lives carrot sticks and kale salad? I don't know about kale and carrot sticks, but I do believe in moderation. I come from a family where weight has always been a struggle. I work70+ hours a week in a sweet shop. Yet I've adopted a belief in allowing myself to enjoy things, just not all the things and not all the time. It's worked for me to the tune of losing 100 pounds in the last year. I believe that there are special times when indulging is fine. Valentine's is one of those times. That's why we offer made-to-order soufflés with a reservation on Valentine's and the Saturday after. Sharing dessert with a loved one on one day shouldn't hurt anyone. Then it's back to the kale. 4 You've helped bring outdoor movie screenings, block parties and charity events to the North Anthony business corridor. What's been the reaction from other merchants and residents? It's been very positive. We get asked often about what movies are coming up and have been thanked randomly when out and about for putting on the various events. As well received as they are, we wanted to make sure they were benefiting the entire area. We're residents of the area as well as business owners and we try and put together things that we would want to do if we weren't busy hosting the event. We've expanded the movie nights to seven dates this year and have started offering neighborhood scavenger hunts themed to the movies as well. We hosted one just a few weeks ago for our 5th Annual Harry Potter day that had 13 businesses from the corridor involved. 5 Be honest, now. 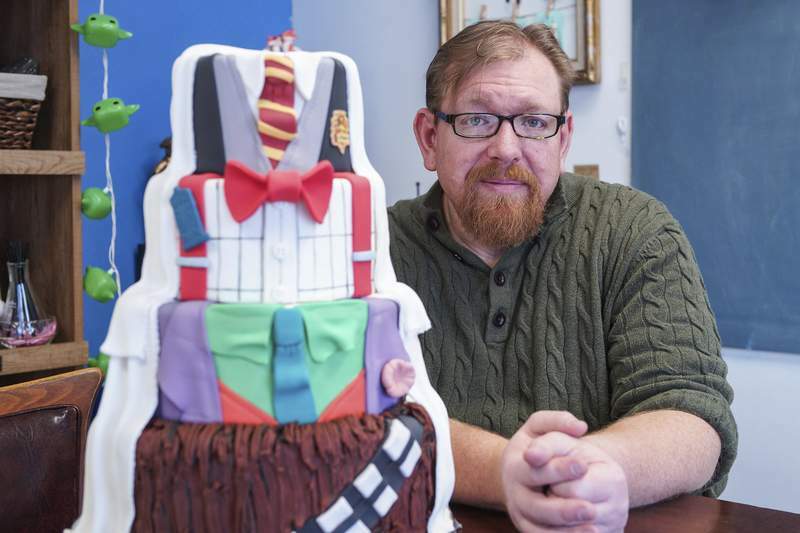 Are the “Star Wars” and “Harry Potter” themes on the treats you make meant to appeal to kids or their parents – or you? The honest answer is they're meant to appeal to everyone. The theme, the catch, the hook, may be pop culture-themed, but the flavors have to be good no matter what. And we see people literally dance with happiness at some of the creations before they ever even taste some of our creations. But it doesn't matter if you're holding wonderful hand-painted chocolate if it doesn't taste good. At the end of the day, that's what matters. Now the names, though, they're my personal joy. Coming up with a good pun or reference, throwing in a dad joke or pulling in obscure silly details are one of my favorite parts about coming up with new items.